Consecration is the solemn dedication of an object or a space for exclusively sacred use; an Abbey of Thelema being consecreted by the presence, control and ownership of real estate by at least a Zelator of the A∴A∴ who chooses to run such an abbey. The Abbot or Abbess serves as the spiritual leader of the community of the household; either as leader of a natural family and/or that also may take in students who seek special instruction from the unique experience and expertise of the Abbot or Abbess. In the tradition of the A∴A∴, any member of at least the Grade of Zelator who owns and controls his or her own property, may declare such property to be an Abbey of Thelema. This declares to the whole of the lineage that special training (according to the individual talent(s) of the Abbot or Abbess) is available for individuals with certain rights and responsibilities apportioned. The general program within the abbey is that of a Magickal Retirement in line with the A∴A∴ course of training; including daily adorations to the Sun, philosophical study, regular yogic and ritual practices, as well as general domestic labor. The object of the program is for students to devote themselves to the Great Work of discovering and manifesting their True Will, while simultaneously learning to respond to the inner and outer events in life with the impeccability of Pure Will. All Zelatores of the Order of Thelema shall have the right to a period of training or ‘Magickal Retirement’ at any Abbey of Thelema upon formal application to the Abbot in charge. Included in the application will be the exact specification of the nature of the training and the length of stay. The Abbot will be noted as being an expert in one or several forms of training in either general or a specialized area of magickal practice. The Abbot will be primarily responsible for the room and board of the Retiree and will practice the art of Thelemic Hospitality. The Retiree will be subject to acts of Karma-Yoga in the day-to-day toil of upkeeping the Abbey, directed by the Abott and a portion of time will be set aside specificaslly for this service with arrangements made for the Retiree to take part in the maintenance and/or development of the household or property as reciprocation for the room and board provided. The word ‘abbey’ originates from the Greek αββας (206 in the Greek Qabalah), which literally translates as father, but is used to signify a domain lorded by one who’s purpose in this case is to assist in deepening the community’s relationship with the divine and to train in those specific Occult arts that would be the specialty of the leader in charge. Most important is that through the abbey, leadership training for the benefit of the lineage is provided; being conferred by the experience of the Abbot or Abbess upon the Retiree. This is a graphic depiction of the “House of Life,” which was part of every major temple complex in Ancient Egypt. 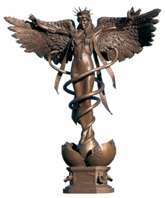 We can find a significant model upon which to base the system of Abbey’s in the A∴A∴ in the Egyptian House of Life, where the practice of wisdom, authoritative utterance, writing and Magick were studied & practiced. This was a place where texts were copied and scribes were trained and a sacred lifestyle dedicated to the divine was maintained. Ritualism and Ceremonial practices along with all the associated disciplines, including medical & funerary practices mathematics, astronomy (astrology), art, morality, and statesmanship were included in the day- to-day living experience. The work of the priests that dwelled within this house were working at the creation of immortality as the house was set up with the four elements placed at the cardinal points of the square (representing the foundation of the pyramid) and eight deities guarded its inner space. 206 (the value of the Greek word αββας) reduces to eight by AIQ BKR, which should be interesting enough for the Qabalist to ponder. But a ninth deity, Osiris, the god of Immortality and Ressurrection was also representative of the fifth element of Spirit; being placed atop the house to show his ascension to the sky in his transformed, glorified and now immortal body. 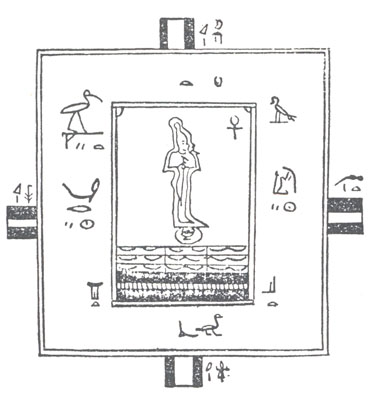 It would seem wise for the Abbot or Abbess of Our Order to implement such consecrated objects about the property in similar manner in order to realize the Abbey as sacred space by transforming it into a symbol of the base of the pyramid, which is the central symbol of the initiatory structure of the A∴A∴ This would energize and focus the spiritual force throughout the property of the Abbey. Here we have yet then, another example of the Magickal Circle squared. A certain example of this is described by Crowley in his novel, Diary of a Drug Fiend. The main characters of the novel are brought to the domain of a Thelemic Mage who essentially cures them of their drug obsession by helping them to discover for each themselves, the nature of their true Will. And though this is not necessarily the intent of a working abbey in Our Order, a general idea of the work of the abbey is presented. The original Abbey of Thelema was a small house which was used as a temple and spiritual center, as founded by Crowley and his Scarlet woman, Leah Hirsig in Cefalu, Sicily in 1920ev. It was meant to be a type of school; a “Collegium ad Spiritum Sanctum” College for the Holy Spirit. Two women, Hirsig and Shumway (her magical name was Sister Cypris after Aphrodite), both became pregnant by Crowley at the Abbey. Hirsig had a miscarriage, but Shumway gave birth to a daughter (11/12/20ev), Astarte Lulu Panthea. From 1931ev, Astarte was raised in the US by Helene Fraux. Astarte would grow up to have four children of her own, including jazz pianist Eric Muhler. 1. Subject to the general discipline of the Lineage, every Abbot is to be absolute master of the house of which he is in charge. Most of what follows is therefore suggestion only. 2. The first principle of the growth of the Order as of all living things is modulation or variation; uniformity is to be detested as a symbol of death. Therefore each Abbey is expected to develop a special character of its own, subject to certain broad principles rooted in human nature: and each Abbey should be the artistic expression of the creative genius and true character of its Abbot. Some will therefore lean to the type of a club, others again to that of the college or university, while yet others will be set definitely apart for the purposes of orphanages, schools or hospitals. But let each Abbot seek with utmost diligence his Will, and express the same in the particular rules which he may make for the order of his house. 3. The Abbey should enshrine four or more lineal lamps of the A∴A∴ that even the mundane household be a holy shrine unto them and generate the feel of ‘sacred space.’ It shall develop its own identity; taking a name in Latin: Villa _________, Abbe de Theleme. 4. Every resident is to remember constantly that he or she is a King or Queen living among Royalty; a God in the company of Gods; and jollity iteself is to be recognized as a ritual of cosmic importance, as it is said “The stars also sang together.” The key of all conduct, generally speaking, is to make every common thing noble, every small thing great. “Seek Beauty! In Beauty is eternal Truth revealed!” The artist is he who can discover Beauty in all things, for nothing is common or unclean; and by unvarying determination to discover beauty man comes to the heaven of the artist. It is the Art of Our Order to kill the belief that happiness of even pleasure lives in rare things or inaccessible, for this is but a folly as that of the child that cries for the moon. The Abbot or Abbess of every Abbey is therefore expected to be an Epicurus, a master of pleasure, an instructor in delight; and he is to know how to obtain all joy, and to be able to teach others to obtain it, by means that are within the reach of all men, excite no envy, and beget no selfishness. 6. When a guest arrives, at an Abbey, the first evening should be set apart to making him or her thrice welcome, and it should be as far as possible the Will of all to acquiesce in the Will of the guest. From the following morning he or she becomes ‘one of the family,’ and settles down to the routine of the house. 7. It is a main principle of Our Order that the power and authority of the Abbot or Abbess, while theoretically absolute, is only to be exercised for the good of all concerned; and any Frater or Soror abusing the great privilege of hospitality by failure to observe tact, courtesy and deference to the convenience and wishes of the Abbot whom he or she proposes to visit will be subject to immediate revocation of their privilege. 8. Every Abbey should develop strongly its own specific tradition, and the individuality of that tradition, by the initiation of customs peculiar to itself. The model may be a madhouse or a university, a nunnery or a brothel: this matters nothing; intrinsic strength, and power of adaptability to environment will survice and grown. But intensity of tradition, and peculiarity of custom, will tend to limit the growth and prevent it from attaining unwieldy proportions. Communes, rather than cities, will develop about each parent house. Yet the interest presented to the Order in general by the individuality of each house will stimulate Brethren to visit and ensure the constant interchange of ideas. Further, the peculiarity of custom will beget esprit de corps and such generous rivalry as now prevails between the Universities of Oxford and Cambridge, owing to the application of the principles above set forth. 9. Now there is no law beyond Do what thou wilt: and the object of rules is therefore only to assure to all men the best conditions for the execution of their Wills.